Interviews about AI HLEG’s ethics guidlines for trustworthy AI with APA, Der Standard, futurzone, Kronen Zeitung, OE24, ORF, and Tiroler Tageszeitung. 8 and 9 April 2019. Interview about involvment in INBOTS for uni:view Magazine, 4 March 2019. Interview about Humanoid Robots for Das Erste, 24 February 2019. 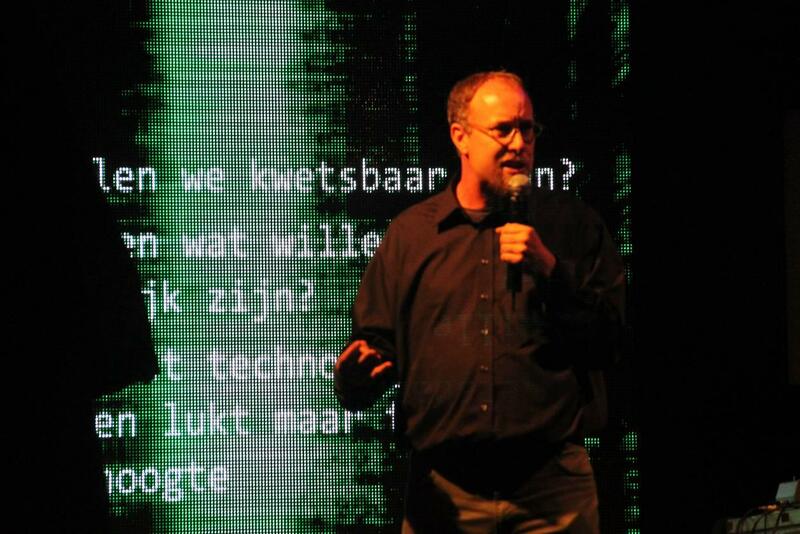 Interview about Killer Robots with Jeroen Verelst for Bloovi, 29 January 2019. Interview for the piece ‘Blijf van mijn robotlijf‘ by Marc van Dijk for Filosofie Magazine, September 2018. Interview with ORF (Austrian Broadcasting Corporation) for European Forum Alpbach programming, ‘Wie human ist die Zukunft?‘, by Julia Gindl, 24 August 2018. Interview for the article ‘De slimme computer die u niet zomaar gelijk geeft‘ by Freek Evers for DeMorgen, 20 June 2018.
Review of my ‘New Romantic Cyborgs‘, ‘Romantische headset‘, by Roland Legrand for De Tijd, 12 May 2018. Interview/expert comment for the article ‘Das Digi-Tier und wir’ for ZWEI UND MEHR. Das steirische Familien-Magazin. Volume: Summer 2018. Interview, together with Janina Loh, Joanna Bryson, Robert Trappl, Oliver Schürer, and Oliver Bendel for the radio program ‘Alexa lacht. Maschinen und andere Gespenster der künstlichen Intelligenz‘ by Katrin Mackowski for Ö1 (Salzburger Nachtstudio), 16 May 2018. Interview/discussion for the article ‘Hier herrscht eine ziemlich defensive Stimmung‘ by Saskia Jungnikl and Eirik Sedlmair for DATUM – Seiten der Zeit, May 2018. Interview, together with Janina Loh, Michael Funk, Hiroshi Ishiguro, Oliver Bendel, and Simon Penny for the radio program ‘Die Mängelmaschine. Oder: Was Roboter noch nicht können‘ by Robert Czepel for Ö1, 14 May 2018. 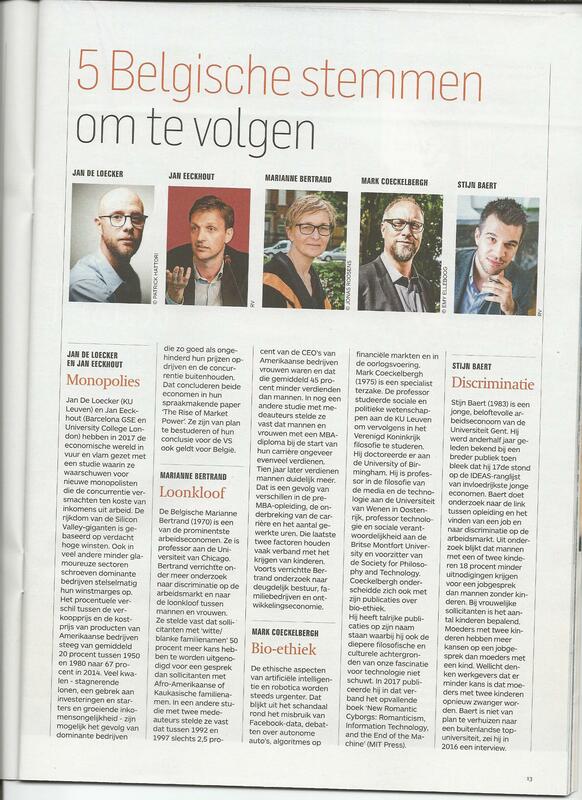 Listed among 5 ‘Belgian voices to follow’ (‘Belgische stemmen om te volgen’) by De Tijd, 12 May 2018 [print version]. Interview for the article ‘Liberté et valeurs humaines dans un monde renouvelé’ for Sciences Psy, 23 March 2018. Interview for the article “Kooperieren, statt den Menschen zu ersetzen” for Die Presse, 10 February 2018, (published online on 13 February 2018). Interview for the series “De Nieuwe Mens” for De Morgen, 27 January to 1 February 2018. [print version]. Interview for the article “Hočemo stroje po naši podobi” for IRT 3000, January 2018. Interview for the article “Een onbehaaglijke confrontatie met onszelf” for De Tijd, 29 December 2017 [print issue 30 December 2018]. Interview for the article “Kryptowährung: Risiken und Nebenwirkungen des Bitcoin” for Spiegel Online, 2 December 2017. Interview for the article “Computer oder Journalist” for Update (4/17), November 2017. Interview “‘Robot Ethics’ is not an oxymoron” for STI Social Trends Institute, 13 November 2017. Interview for the article “Ledereen Robot? : ETION Forum 2017” for Ondernemen, 73(5), Oktober 2017. Interview for the radio broadcast “Radiokolleg – Die Grenzen der Empathie” for Austrian radio station Ö1, 16 October 2017. Interview for article “As AI advances we risk losing our free will” for The Times, 14 October 2017. Podcast “Wanneer ethicus en technicus samenkomen” for gentm Blog, 16 September 2017. Interview at the Ars Electronica Festival, Linz for FM4 Connected, 10 September 2017. Interview for DeMorgen on ethics of military robots, 22 August 2017. Interview for DeStandaard on Google, 10 August 2017. Interview for Handelsblatt on cryptocurrencies, 10 August 2017. Interview for ZIB2 report (ORF, Austrian Television) on “Gefahren der künstlichen Intelligenz“, 19 July 2017. Interview “Episode #21 – Mark Coeckelbergh on Robots and the Tragedy of Automation” by John Danaher for the podcast Algocracy and the Transhumanist Project, 23 April 2017. Interview “Curators who will have Impact – an interview with Mark Coeckelbergh” by Artdependence Magazine, 06 March 2017. Interview “Hør Harddisken: Danskerne frygter ikke kunstig intelligens” by DR Netradio, 25 November 2016. Interview by CNN http://edition.cnn.com/2015/02/13/tech/spot-robot-dog-google/ topic: Is it cruel to kick a robot dog?